Seriously. I have taken 2.5 practice exams and scored 65-70%. However I have been guessing on 60-70% of all the questions. I have had enough. I owned all these sections when I went through them over the last 7 months - even the last month when I was doing CFAI EOC questions (all of them). I ruled them. The material ISN’T HARD. But doing ALL the material at once is simply impossible. Really, it is. There is no F*CKING way you can memorize ALL this stuff at once AND keep all this crap fresh in your head. One chapter, easy. One book, no problem. But the WHOLE THING?! I am just tired and very pissed off at the world now. I have spent hundreds of hours that will probably amount to nothing come Mid-August (or whenever results come out). I don’t understand how some people get over 80% on these tests. Unless you work in this stuff I don’t see how it can keep it fresh in your head. God I am so angry. The only performance that matters is Saturday and thereafter. Stay in the marathon a few more. I’m pretty pissed off today too. Here’s two of the rockstar mistakes I made on the cfai mock: forgot to add Rf, forgot to add equity Net Income to parent, forgot how to add and subtract…the list goes on. And OF COURSE, there’s an answer choice that fits in exactly with those mistakes. Portfolio Management was my little pet, my favorite “little” section, TB and all…rocked it for the schweser mock and for the cfai mock it was as if someone literally came into my brain overnight and sucked out all knowledge from anything remotely connected to SS18. You’re right. You can’t memorize everything. And you don’t have to. You do need to find the time between now and Saturday morning to trust yourself and know that your level of preparation has not been in vain. Then you sit in front of that test booklet and you do your very best. We will drink and be merry between then and August. July will be an awesome month. And then the results will show what NOT ONE SINGLE ONE of us can predict until then. Be angry, get un-angry, know what you know, and rock it on Saturday. I’m writing this for you and me too. hope it helps someone, I think it helped me….. Sorry bro. For me, my exam prep has been all about the last month. I put in around 50 hours before May and have been studying 5-6hrs a night since then. There’s no way I could have started 6 months ago and retained half of the information. 65-70% is not the end of the world. Are you really guessing on that many questions? agree with almost everything you said. i work with a decent chunk of this stuff and still feel the same way. on top of just trying to retain all the stuff, CFAI tests it in a purposely deceptive/misleading way in many questions and throws in questions on minutia. The truth is that all we need is somewhere in the mid to high 60s to pass on the real thing. That gives you a lot of room to f-up ambiguous questions and forget stuff, if you think about it. The key thing I’ve been focusing on is a strategy to maximize my “educated guesses” on questions where I have no clue whats going on. There are frequently clues that can help you narrow down choices without knowing the answer directly. Assume you completely forget/get confused on 1/4 of the questions, as long as you can eliminate one choice through educated guessing and run a 50% rate on those, then all you need to do is average ~75% on the 3/4 of the questions that you actually do know and you will pass. dont burn out on practice tests too soon before the exam…it will kill your confidence. Maybe take the tests with the idea that they are a study tool. Check each question after you do it and learn it at the moment, not in retrospect??? Stay strong PistolPt, we are all in the same crazy boat and I bet you will kill this exam. When you do..and you nail L3 next year, the value of your Charter will be ‘worth’ that much more b/c this crap is so insanely difficult to comprehend and thus, pass. I agree - the method and style of testing is horrendous, but it is what it is. We don’t want this becoming a CPA exam, where its value is questionable. Just know that it’s your confidence level and coolness that will make the difference on Saturday. Just be brave and don’t let it control you. I wonder if most candidates are even getting consistent 65-75% scores though, besides AFers. There’s no way to master all of the material, some sacrifices will have to be made when it comes down to the wire. I got my first over 70 today [74%] and I felt like a freaking rockstar. I know people have been posting things like 75, 84,79 as their exam scores for weeks, but for me, that felt awesome. I think you don’t have to remember EVERYTHING, Pistol. What you need to remember is the majority of stuff that is the most likely stuff to be tested, plus a smattering of the other material. I can promise you that if the test was 100% made up of Private Equity, Real Estate Valuation, Venture Capital, and Hedge Funds, I’d fail it hands-down. However, I know that come exam day, we will probably see one vignette on ONE of those [falling under the heading of “alts”], MAYBE one vignette that involves two of them. Meanwhile, I’d bet dollars to doughnuts that between pension accounting, foreign earnings translation, and accounting for investment in associates, we’re extremely likely to see two vignettes with some of that stuff on it. So I’ve spent a good amount of time making sure I know those things cold. Just get the “very likely” stuff as best as you can. All of the ‘other’ stuff, know what you can as best you can. The entire test will not be on [tries to think of something obscure…] fixed for floating currency swaps. However, you can bet that there will be sections on currency trading, expected inflation rates, and the like. Again, don’t go for everything. If you feel overwhelmed, take your most recent few mocks, look at the ‘big’ sections that come up time and time again. FRA, Equity, and Ethics are good places to start. Make sure you get the big sections, and you may come out OK if you do so-so on the other sections. Don’t give up. My trend: 83% (Tue) 80% (this morning) 75% (this evening). My gf’s trend: 67% (Tue) 70% (this morning) 77% (this evening). Aww that’s so cute. Better catch up dude! It’s normal feelings man. You know way more than you realize. Every time you see something you don’t know at this point, it’s going to make you feel that way. Just make sure you aren’t all lathered up on Saturday…seriously. The best thing you can do for your score is to let your brain recover so it can perform on game day. my 2 cents..
At this poin its too late to worry about mock scores, its all about grasping why they were lower than hoped for and getting those concepts down. After EOC Qs and plenty of Mocks we will have seen vignettes about most topics and various formulas and qual. questions had to be revisited… It should all come together Saturday, just keep your cool. > 60-70% of all the questions. I have had enough. > when I was doing CFAI EOC questions (all of them). > I ruled them. The material ISN’T HARD. > Mid-August (or whenever results come out). > don’t see how it can keep it fresh in your head. > God I am so angry. I feel exactly the same way. The worst thing is some people have amazing memories which allows them to retain useless facts they hardly use. Mine works completely the opposite. This is my second attempt and I had the same rant as you last year. I figure just give it your best shot and see what happens, there’s no way you can remember everything but just think it’s ALL OVER in 2 days! Also you will have no idea how you did for 2 months, unless you really think you screwed it, but either way there’s not much point worrying about it until results! winding down now….it has been a long ride. I am so distracted today - can’t concentrate of any topic. I don’t think I will ever understand ICAPM and Currency Swaps. Busy chatting to my buds now and we’re all mentally and physically spent! I am almost thinking about going into work and saving 1 vacation day - this thing is exhausting mentally, physically, emotionally and all other *allys. No joke - I was thinking of this also. I was going to go to work to “unwind”. So…I expect to encounter questions that I will not be able to answer correctly. A few of them. I expect to answer more questions right than wrong. I expect to do my best, RTFQ, and know what I know. I’m glad I had my tantrum yesterday. Today I woke up elated at the thought of this being over very soon. I can pass this exam. And I respect it’s challenging nature, it’s what brings value to the charter, and what drives me toward achieving it. Just keep in mind the swap has to be valued in terms of a single currency, depending on what the question is asking for. A swap in $1 is not the same in terms of a swap in SFR 1. You have to either convert the $ side to SFR at the beginning and current rates or vice versa in order to find your true value. You can even value you it in terms of both currencies if that makes it easier for you. > > no-mans land , and have to do it over again. > question is asking for. > versa in order to find your true value. > currencies if that makes it easier for you. hence why changed to notional currency which is then adjusted by changes in the currency. BPDULOG! you gotta write these CFA books! you said it in 2 sentences….those books send us on a 3 page adventure to no-where explaining this concept. I decided not to do any more mocks after Tuesday since they are somewhat draining and leave less energy to study. I had a nice upward trend on my mocks (67, 73, 82) so I’m feeling OK but not overconfident. Something I remember from my days as a runner – when training for a marathon, it is usually counterproductive to run 26.2 miles in any one training session. Better to mix it up with varous training techniques and then spend your total energy on the race itself knowing that you didn’t needlessly drain yourself while training too close to the race. I’m cementing via flashcards and continual review of the wrong answers I got on the three full mocks I did take. 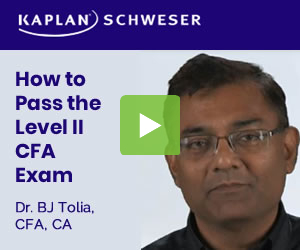 I’m also going to re-read the CFA ethics topics and examples and watch some Schweser videos. Like many of you, now it’s all about ensuring we make as few easy mistakes as possible and get as many “freebie” points on the test as we can simply from knowing the price, valuation, and general characteristics of all investment types. The CFA website says that L2 is generally about valuation so that’s my mindset! Scored a 63%. Total. So my full mocks have gone 71, 67, 63… thats not good. Especially since I’ve been reviewing and (at least I thought) learning from my mistakes. On another note, I don’t know if learning from your mistakes helps with all the Schweser exams. I think they space out the vignettes so that aside from ethics, you’ll never see the same type of vignette twice in all the exams. So you are just pushing other knowledge for future exams out when you are learning this one. All of the mocks from CFAI/Schweser/Stalla were harder than the real thing. Much harder. I’m hoping it’s the same for Saturday and will confirm once it’s over. Of course the vignettes won’t repeat. The whole point is to cover the entire curriculum in exam format in 3-6 full exams(AM/PM). Seeing some permutation of a question at least once should help you remember something that’ll jog the memory come exam day. What helps me is to think of other ways the same question could be asked so one of the wrong answers is the right one next time. If you know why answers are wrong in addition to the right ones being right, you’re in good shape. Always remember, you’re supposed to be able to pass this using ONLY the curriculum. And certain topics they don’t even have EOC questions for. I’m amazed some people still pass without the help of Schweser/Stalla etc and just using the samples and mocks. There’s a message there. I’m just reading through the answers on the Schweser mocks. Don’t have time at this point to actually take them. I think it really helps to simply understand the type of questions they are throwing at you and the reasoning for their answer. Reading the answers also avoids the potential morale crusher when you “fail” one of these things. I hardly believe that the only point of these mocks is for you to “pass” them. Remember that they are simply learning tools and the ONLY test that counts in terms of passing or failing is tomorrow’s. Totally agree. If you still have more than 1 mock, don’t take 3 hours of your time anymore to solve each, and then another 1 to grade it. just read through them. The exam is so close now that your short term memory might store whatever your read. If you see a question that you don’t know how to solve, spend a few more minutes on it. That’s what I’m doing anyways. I just looked at the L1 book sitting behind me….those days…soo innocent. Hahaha +1. L1 was so easy compared to this!